The XJC Jaguar is a two door Coupe version of Jaguar’s very successful XJ Series 2 saloons. It was produced from 1974 to 1978 and only a relatively small number were built, especially V12’s, which makes it a very rare and collectible classic car today. In today’s market it is rather difficult to locate an original Coupe in very good condition. In fact finding any top condition Jaguar XJ Series 2, especially a V12, is quite a challenge. Unfortunately many have found their way to the scrap yard thanks to neglectful owners and Jaguars major downfall “RUST”. Many of the Coupes that come onto the market are in need of expensive repairs and rebuilds and others that seem sound may not be as good as they are represented. Despite the fact that the Coupes are nearly fifty years old there are still some outstanding examples of XJC’s around and they continue to grow in popularity as conscientious owners lavish time and money on maintenance and restorations. As can be seen from the production figures below only 10,426 Coupes were built for world distribution compared to 116,652 XJ Series 2 Saloons. The V12 powered cars are the rarest with the Daimler V12 being scarcest of all. Only 603 Jaguar XJC V12's were built in right hand drive and only 97 were sold new in Australia. My XJC is one of the original 97 and only 39 are known to still exist!. 140 XJC 4.2’s were sold new in Australia. Over the years a small number of used Coupes have also been privately imported into Australia . The two door XJ Coupe was based on the short wheelbase four door Jaguar XJ saloon and the front and rear designs were left unchanged, even the front windscreen and rear window are the same, but from the side the difference is very obvious. The first prototypes were built using short wheelbase series 1 XJ saloons and one of these prototype vehicles still exists and lives in Western Australia. Jaguar used as many existing parts and panels as possible from the four door saloon to minimise development costs. 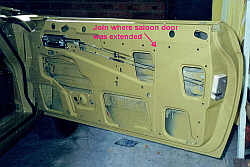 For example, the door shells were made by joining an extended section to the end of the original saloon door to provide a 100mm (four inch) longer door rather than manufacture an entirely new door shell. A large strengthening panel runs through the middle of the door and this plus the elaborate window operating mechanism results in rather heavy doors which required heavy duty hinges. The XJC uses the stock sill panels from the short wheelbase saloon and if you look closely you can see the indentation where the original centre pillar was intended to be welded. During development of the Coupe Jaguar experienced a great deal of difficulty in sealing the side windows to the roof line and this delayed the release of the XJC for quite a while. 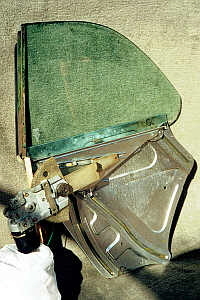 To overcome the sealing problems the engineers developed rather complex door and rear quarter window mechanisms. The power windows had to to raise and lower easily but still maintain enough pressure to keep the windows against their seals, even at high speed. An additional objective was to have the windows completely disappear inside the panels to provide a windowless side presentation with the windows down. This system must have taken a large amount of development time but wind noise at high speed and poor weather sealing is still a common problem with the XJC today. The Coupes were produced in both Jaguar and the more upmarket Daimler versions and they were all fitted with a vinyl roof. Various theories have been put forward to explain the vinyl roof but the most common belief is that it was a design decision to enhance the appearance of the pillarless saloon. Only a handful of special order XJC's left the factory without a vinyl roof but some owners have removed them over the years. The interior is the same as the short wheelbase saloon except that the front seats fold forward to allow access to the rear seat and the seat belt anchor points were also moved. Rear seat accommodation, leg and head room are much better than most two door Coupes and the large front doors make entry and exit much easier than the saloons. The combination of leather trim and polished timber add a touch of old world charm to the interior, although the general design was a bit dated when it was built. Unfortunately the 70's were not a good period for corporate Jaguar (under Leyland control) and this was reflected on the production line where disgruntled workers were not concerned about quality control. and all Jaguars suffered. If you take a close look at a Series 2 Jag you will notice many fixtures and fittings that could have been better finished and the paint and panel fit is often poor. The XJC used the same mechanical specifications as the saloon and the superb four wheel disk brakes (four pot callipers and ventilated rotors on the front), fully independent suspension and power assisted rack and pinion steering were very advanced for the time and provided the cars with a legendary smooth and quiet ride with exceptional handling and braking. Even today the front and rear mechanical assemblies are in demand by builders of performance cars, kit cars, hot rods and Cobra replicas etc. The XJC could be ordered with either the legendary 4.2 litre, twin overhead cam six cylinder with 170 bhp (127kw) or the powerful but thirsty 5.3 litre V12 with 285 bhp (212kw). The V12’s lightweight aluminium block and heads, sophisticated overhead camshafts and advanced fuel injection provided a powerful and unburstable engine that propelled the XJC to a top speed of 140 mph (225 kph).